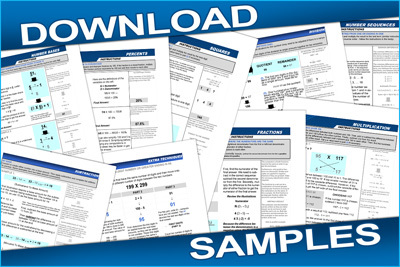 The mental math techniques contained in the MATH SUBJECTS section are based on the same 14 math subjects found in the 1500+ pages and Bonus package eBooks. 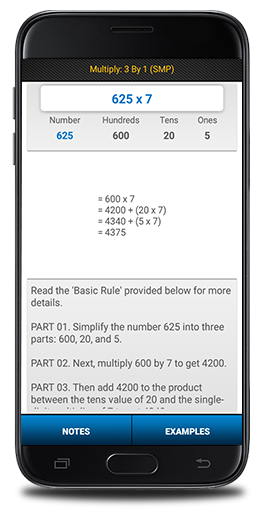 Though the app does not cover every single technique in the two eBooks, roughly 180-200 mental math techniques or shortcuts are available with over 400+ examples. 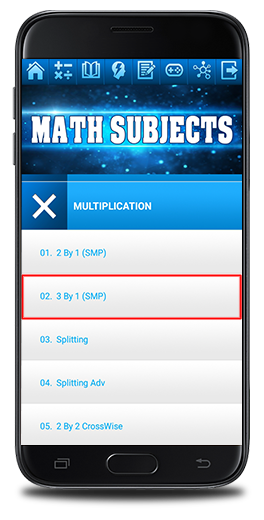 Here are three samples (screenshots) from the MATH SUBJECTS section. Many techniques exist in the MULTIPLICATION subject. A list of techniques is displayed when pressing a subject menu item. Below represents the “3 By 1” technique. TThe DIVISION subject has over 20 techniques. The highlighted technique above is for learning the divisibility rules for dividing by divisors 2 to 9. The FRACTIONS subject covers many techniques for adding, subtracting, multiplying, dividing, comparing fractions, and includes methods for converting fractions into decimal numbers. 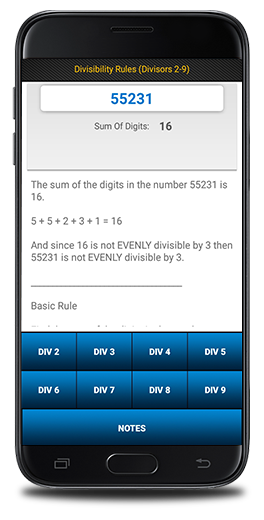 This technique is for multiplying three digit numbers by single digit multipliers. Press the EXAMPLES button to auto generate a new problem and step by step instructions with computations along with explanations are shown the explanations are scrollable if more space is needed. These techniques are rules regarding divisors 2 to 9 . Press a divisor and the program automatically generates a problem with explanations. Continue by pressing the same divisor or choose another divisor. Again, the explanations are scrollable if additional space is required. Techniques for adding proper/improper fractions together does not involve finding the lowest common denominator (LCD). Read the explanations to learn and apply the technique properly. Press the NOTES button for additional information regarding this program.